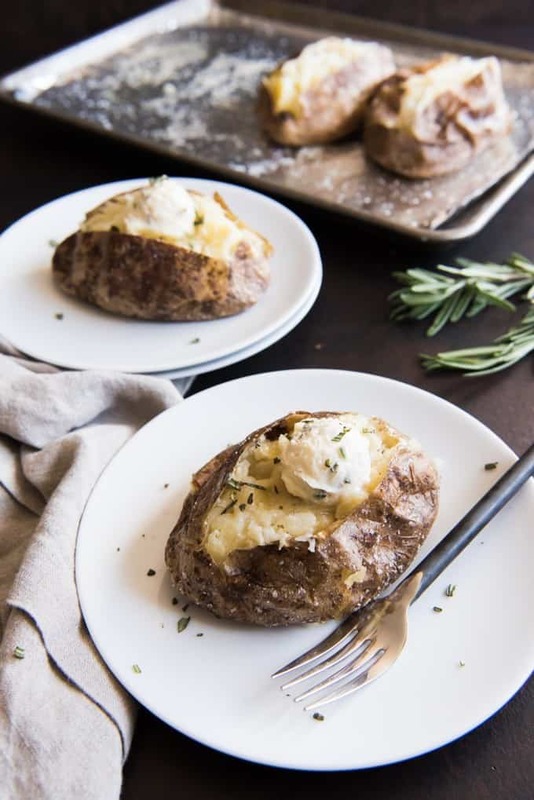 Baked potatoes might seem basic, but these Salt Crusted Baked Potatoes with Roasted Garlic & Rosemary Butter are anything but. Simple and easy, yes! But elevated too, thanks to a couple of baking tricks and an amazing compound butter that melts all over the fluffy insides of a perfectly baked Russet potato! 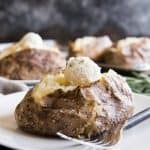 These steakhouse style salt crusted baked potatoes are wonderful with a crispy, flavorful outer skin that gets coated with olive oil and salt to ensure a wonderfully tender, moist and fluffy baked potato every time! 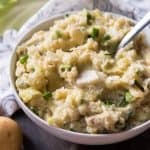 And since potatoes are naturally gluten-free and vegetarian-friendly, they are wonderful to serve if you have friends or family with dietary restrictions. I ate a lot of potatoes growing up. My mom’s side of the family is from Idaho and my grandma is from Blackfoot, which is known as the “Potato Capital of the World”. I remember driving past the “Free Taters for Out-of-Staters” sign every summer on our way up to Yellowstone for our annual camping trip, and we always took back a big box of real Idaho spuds to Nebraska or California or wherever we happened to be living at the time. So I am super excited to partner with Potatoes USA to share one of my favorite types of potatoes – the classic and iconic Russet potato! 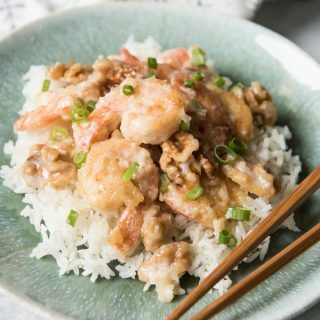 They are super convenient, inexpensive, and are a key staple in every cuisine around the world for good reason! I would guess most people are more familiar with the texture, flavor, and appearance of russet potatoes than any other potato variety. Russets are known for their thick skins and starchy, white flesh and mild flavor. They are perfect for baking, frying, mashing, and roasting, and they are definitely my favorite potatoes for fries, like these Baked Greek Feta Fries. Russets are also typically the largest potato variety you will see at the store or farmer’s market. 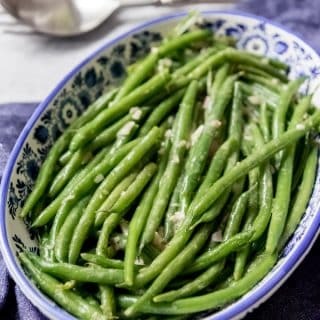 One of them per person makes a good side dish or even a meal on its own. When it comes to salt crusted baked potatoes, I tend to look for the medium-size russets instead of the really large ones, both from the standpoint of how long they will take to cook (the bigger ones can take significantly more time to bake all the way through) and bearing in mind that you will probably want to serve one potato to each person at the table, rather than cutting gigantic spuds in half. I buy the bigger russets when I’m doing fries or making light and fluffy mashed potatoes. 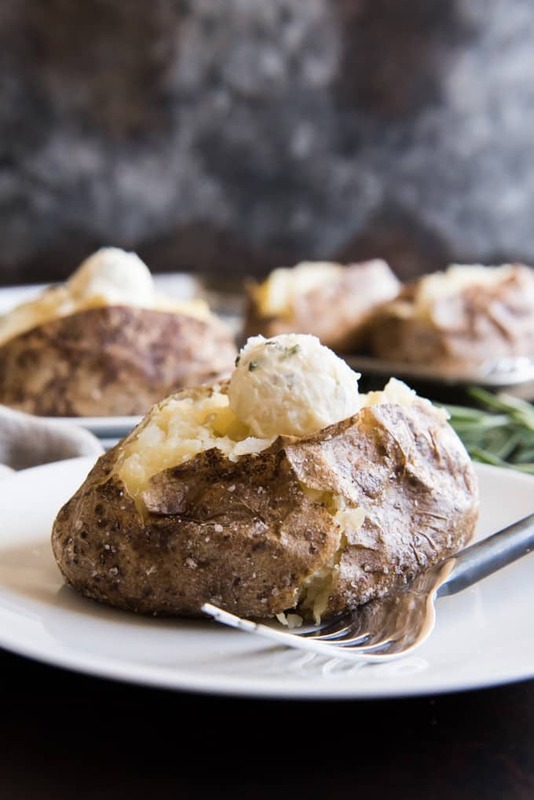 Russet potatoes are the ultimate culinary canvas for all kinds of toppings on your salt crusted baked potatoes, from traditional sour cream and chives, to shredded cheddar cheese and chili for more of a main dish approach. But my very favorite thing to top my baked potato with is this roasted garlic & rosemary compound butter. 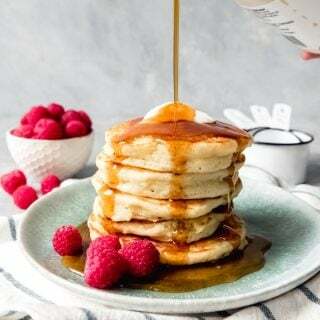 The term compound butter sounds fancy and impressive, but really, it’s just softened butter mixed with some flavorful ingredients like fresh herbs or spices, then refrigerated until firm. The one I’m sharing here is one of my favorite flavor pairings – roasted garlic & rosemary – and it couldn’t be easier. 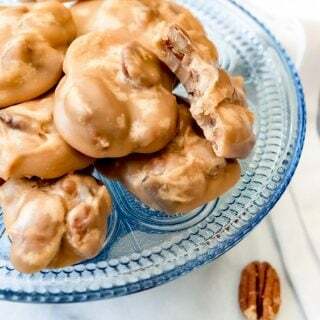 Just place a stick of softened butter in a bowl along with an entire head of roasted garlic cloves (that you can roast right along with your potatoes), a little fresh chopped rosemary, and season it with salt, then mash it all together. 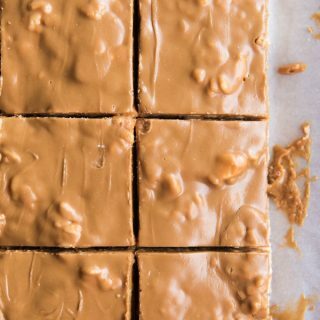 After that, I like to scoop it out in little mounds onto a plate lined with plastic wrap and chill until firm, but you could also transfer the butter to a sheet of plastic wrap and roll it up into a small log, then chill until firm and slice off little rounds to serve with your baked russets. 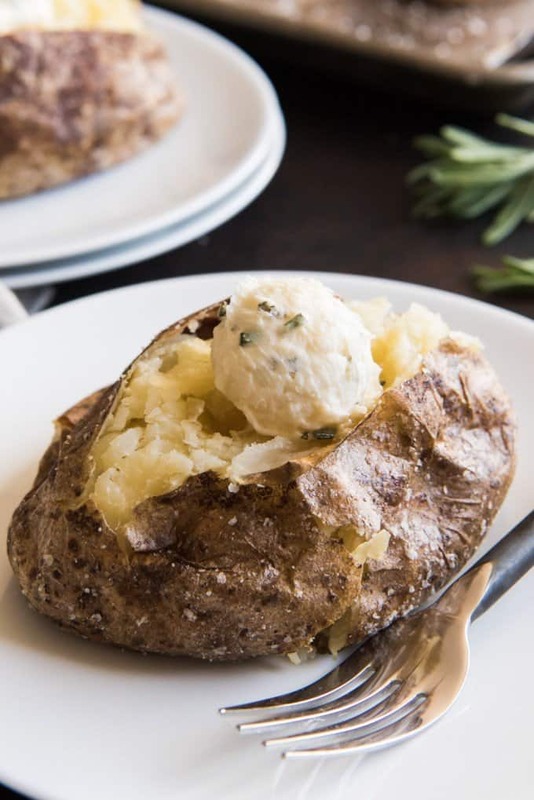 As each pat of compound butter melts from the heat of the potato, the flavors infuse each bite of fluffy, creamy baked potato dreaminess! 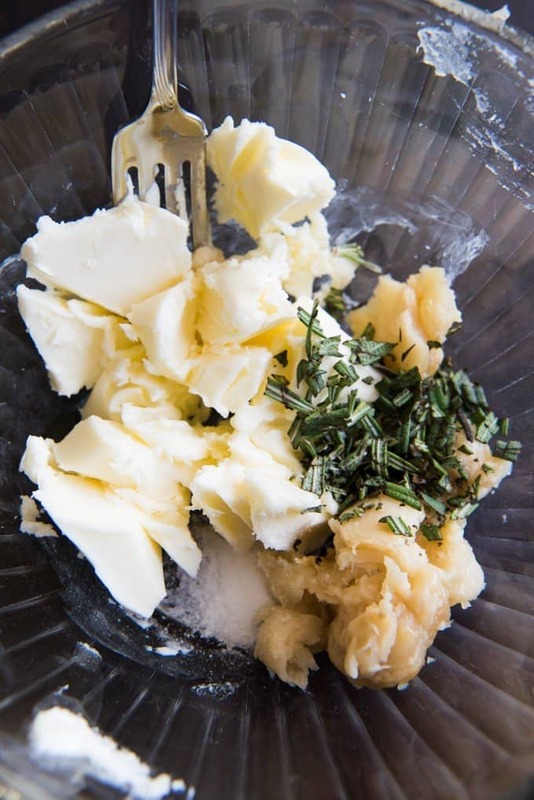 Roasted garlic & rosemary compound butter is also wonderful served over a medium-rare steak, roasted chicken, or fish! And you can always swap out the roasted garlic and rosemary for other ingredients, both sweet and savory, to change up some of your other favorite dishes! The basics are pretty straightforward. 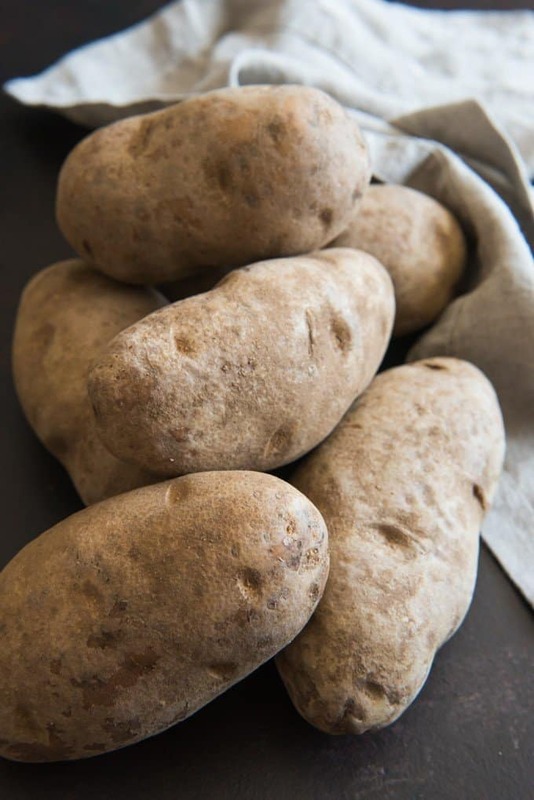 Wash your russet potatoes under running water, using a clean scrub brush to remove any dirt from the skin. Then pat them dry with paper towels. After that, drizzle the potatoes with olive oil and rub it all around to completely coat the skin of each potato. Then generously sprinkle coarse salt over the potato, rubbing to coat all sides with salt. And that’s it! Then they just go in the oven and bake for about 45 minutes to an hour, depending on how large the potatoes are. Now, some of you might be reading this thinking I’ve missed a step or two. But I’m going to say a couple of potentially controversial things here that I really think make a big difference between a mediocre baked potato and an amazingly delicious one. 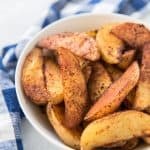 Loads of people and recipes from reputable online sources say you have to poke holes in the potato with the tines of a fork before baking. But I disagree. That just lets steam escape while the potatoes bake, and the result is more often than not a dry, mediocre baked potato, at least in my experience. And the whole poking-holes-keeps-the-potatoes-from-exploding thing is nonsense. That only happens if you overbake your potatoes! Which we’re not going to do, are we? No. Just bake the potatoes whole and unpunctured – we actually WANT to trap the steam inside – and you will end up with nice, tender insides. And if you are worried about possibly overbaking, that’s what kitchen timers are for, right? I think the idea behind the foil-wrapped baked potato is to trap steam and keep the potatoes moist inside. But the reason I don’t like this method is because it sacrifices the skin of the potato, which gets steamed right along with the insides. Which is why I always left the potato skin on the plate as a kid. I prefer rubbing the clean, dry russets in olive oil and generously coating them with salt before baking. Not only does it result in a crispy skin that is much more pleasant texture wise, but it also imparts amazing flavor as well. 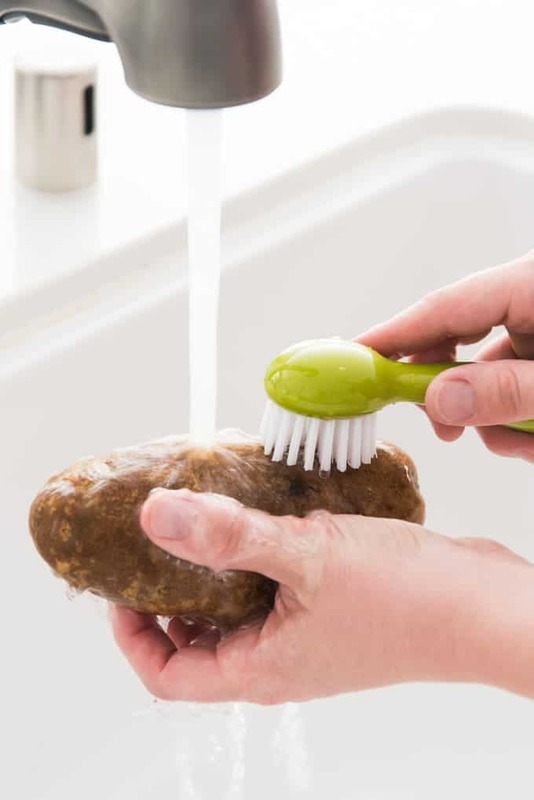 And if you worry that the potatoes will be too salty, you can always brush some of it off after baking. 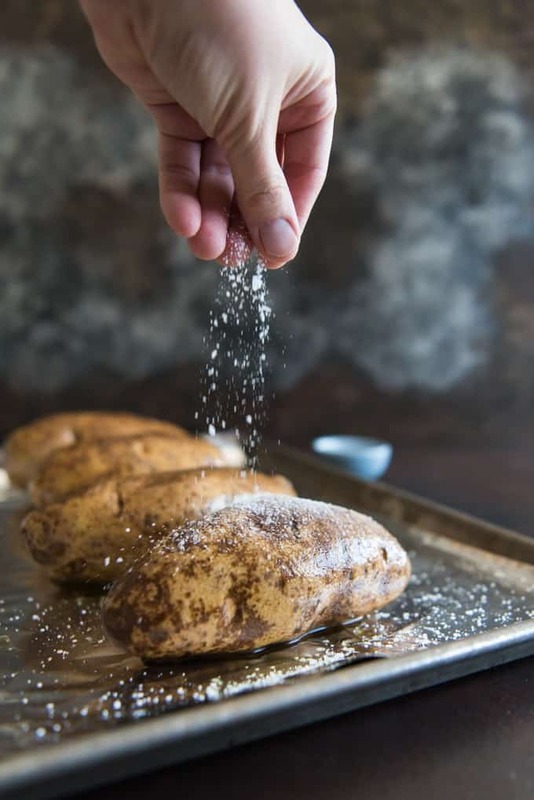 If you have never tried this method before, you will be surprised at what a difference the salt on the outside of the potato makes, even on how the insides taste! This part is very scientific: You squeeze the baked potato with your hand. Cover it with an oven mitt first so you don’t burn any fingers. If it’s soft, it’s done! If it’s hard, let it bake for another 5-10 minutes! 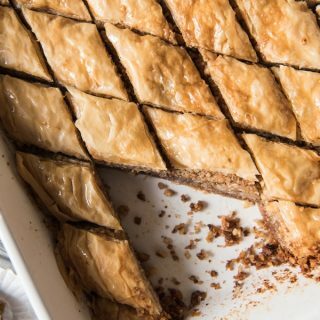 Giving a baking time can be tricky because potato sizes can differ widely, but this squeeze test is pretty much foolproof. 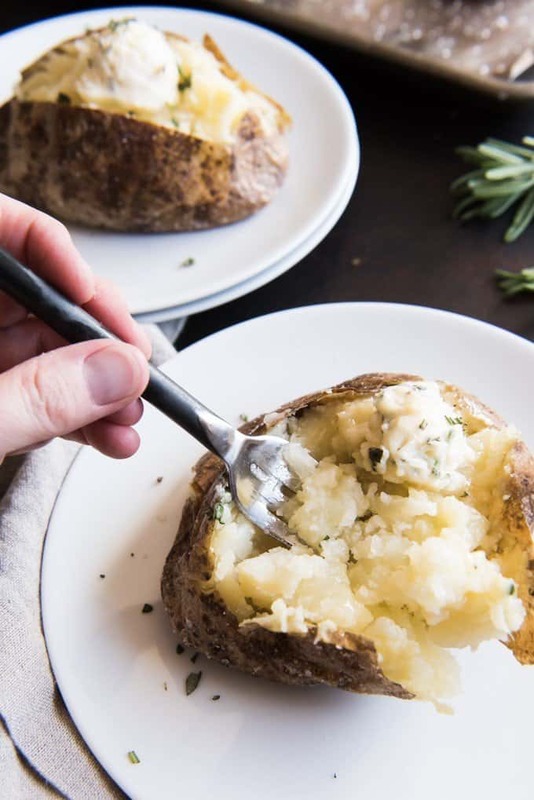 I have also heard that if you drop your perfectly baked russet potato onto a cutting board from about 10″ up before cutting into it, it breaks up the inside of the potato, making it even fluffier and light when you cut into it. Now, that one MIGHT be a myth, but it definitely hasn’t hurt my baked potato game. If you try it, let me know what you think in the comments below! Be sure to check out the Potato Goodness Facebook page for more spud inspiration using russets and other types of potatoes! 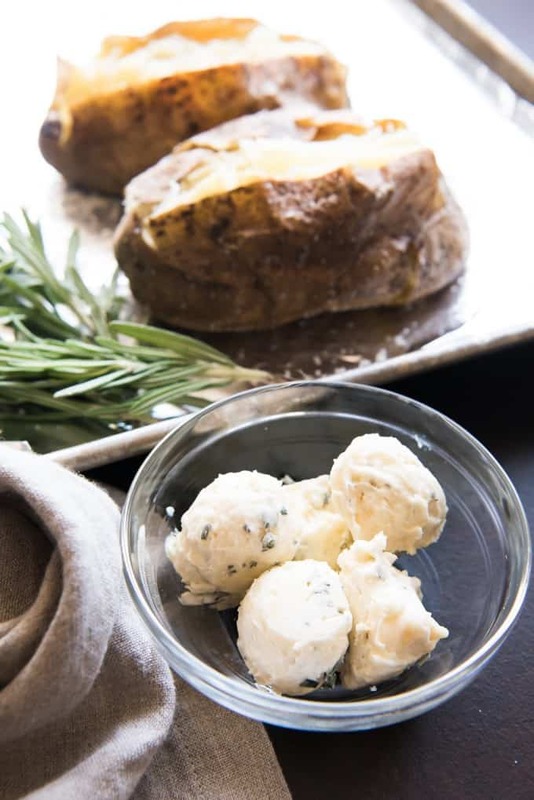 Baked potatoes might seem basic, but these Salt Crusted Baked Potatoes with Roasted Garlic & Rosemary Butter are anything but. 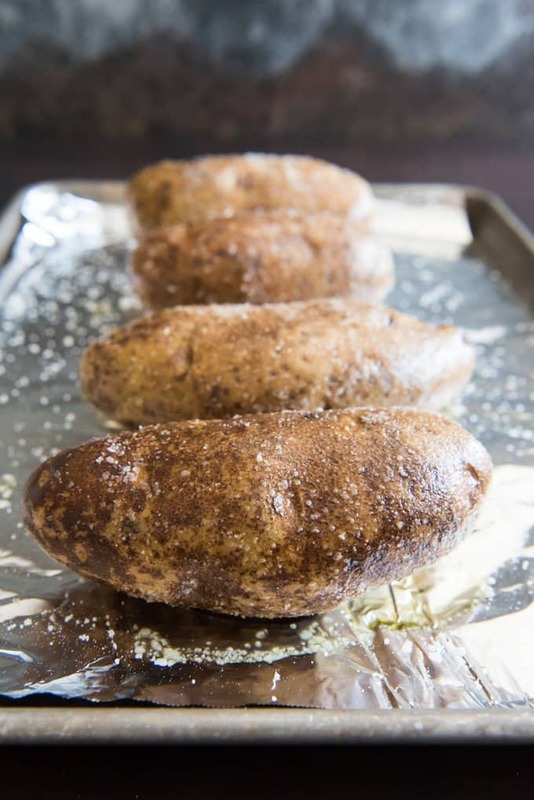 These simple and easy steakhouse style russets get coated with olive oil and salt before baking, ensuring are a crispy, flavorful skin with tender, moist and fluffy insides! 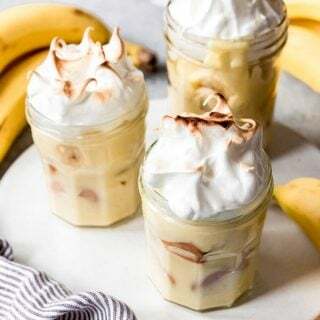 Naturally gluten-free and vegetarian-friendly, these are wonderful to serve if you have friends or family with dietary restrictions. Scrub the russet potatoes to remove any dirt. Dry with a paper towel. Brush or rub each potato with olive oil, enough to completely coat them. Sprinkle each oil-rubbed potato generously with 1/2-1 tablespoon of salt, rubbing it around to evenly coat the skin of each potato. 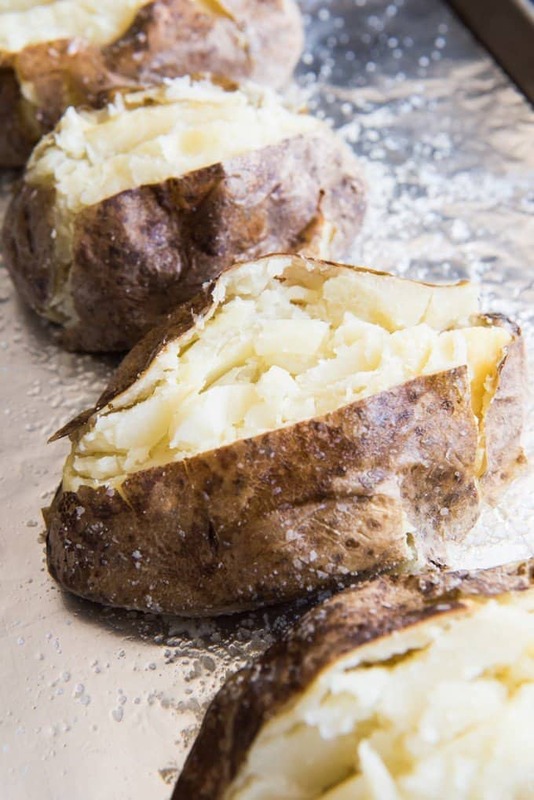 Place potatoes on the foil-lined baking sheet. Do not poke holes in the potatoes! In a medium bowl, add the softened butter, salt, and rosemary. Squeeze the roasted garlic cloves out of the papery skin into the bowl with the butter, and stir or mash everything together until combined. Line a plate with plastic wrap and drop spoonfuls of the butter mixture onto it before refrigerating until firm. I am a potato lover, so this works for me. The humble potato really can be transformed into so many delicious recipes. 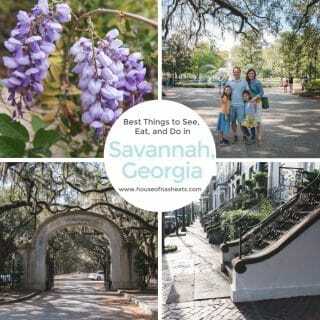 You can never have too many ways to enjoy them…according to me!! I love potatoes and I love Butter. I love the fact that you sprinkled salt on them before baking. Awesome! And how cool that you found a vegan butter that tastes like regular butter! 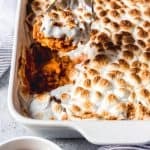 My dad loves baked potatoes and I will have to make this for him. Nice touch with the roasted garlic butter and salted crust. I agree, never use foil or poke holes.